When Nebraska hired Mike Riley as its new head football coach, some were perplexed. How could Nebraska fire Bo Pelini after another nine-win season, something he had achieved in each of his seven years in charge? While the reasons for Pelini’s dismissal were legion (and discussed by a smart and particularly handsome analyst), the fact remains that the bar has been set high for Riley in year one. Win fewer than nine game—heck, maybe win fewer than ten games—and some fans will be baying at the moon about how Nebraska was better off under Pelini. So, will that happen? Of course, it’s far too early to be making definitive projections about a college football season still months away. But there’s still plenty we do know to make at least some educated guesses about how 2015 will unfold for Nebraska. Nebraska fans should be terrified of this game. BYU comes to town with (at least at this point) a healthy Taysom Hill at quarterback. 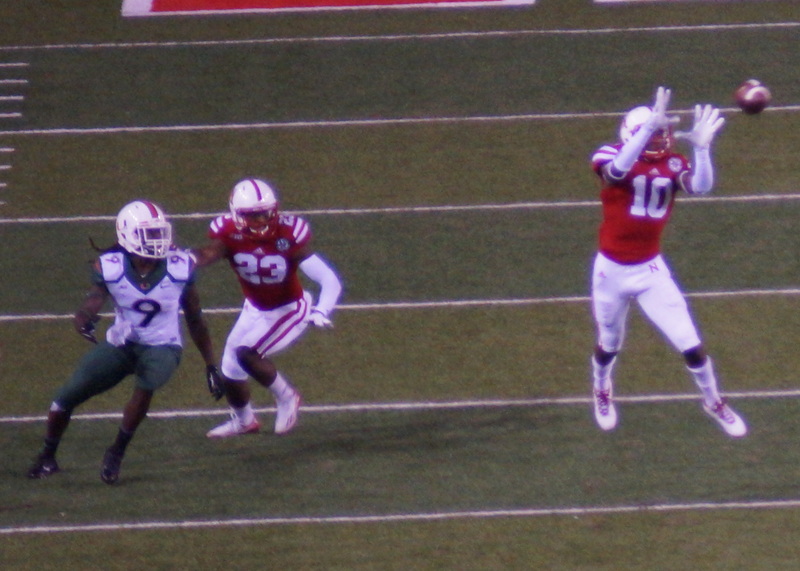 He’s adequate as a passer and dynamic as a runner, and that combination has given Nebraska defenses fits in the past. As for the Cougars’ defense, according to CFBStats.com it’s good against the run (no. 20 nationally) and not so good against the pass (no. 114). So in game one of the Riley era, Nebraska will face an opponent that will push it away from what it does well offensively and towards what it doesn’t do well. The difference in talent level (as of 2014, Nebraska’s talent ranking was no. 24 and BYU’s was no. 71, according to the incredibly-useful CFBMatrix) should be enough for Nebraska to win. But don’t be at all shocked if Riley starts his career in Lincoln at 0-1. South Alabama isn’t exactly a paycheck game. The USA Jaguars did go to a bowl game last year, and did absorb a number of players from the now-defunct UAB Blazers football program. But even with that influx, the gap in quality between the two teams should be more than enough for Nebraska to comfortably expect a victory. In 2014, Nebraska won a bare-knuckle street fight of a contest in Lincoln. In 2015, both star tailbacks (Ameer Abdullah for Nebraska, Duke Johnson for Miami) are now on NFL rosters. But Miami will have the benefit of a settled head coach in Al Golden, think what you will of him. Sophomore quarterback Brad Kayaa will be settled in to his offensive duties. And Miami will easily be the most talent team Nebraska will face in the non-conference season. Particularly if Nebraska gets by BYU in the lid-lifter, a win over Miami could give Riley fantastic momentum and buzz. But given the travel (even though Miami is hardly an intimidating road game) and talent level of the Hurricanes, that’s an awfully big ask as Nebraska transitions to life under Riley. It’s really remarkable what’s happened to the Golden Eagles. In 2011, Southern Miss was 12-2, and looking like a non-power-conference team on the rise. In the next three years, Southern Miss has gone 4-32. Yes, the Golden Eagles will likely be better under head coach Todd Monken’s third year in charge. And yes, it was Southern Miss who delivered a stunning upset to Nebraska in Bill Callahan’s first year in charge. But that was a different Southern Miss team in 2004. The Golden Eagles’ appearance on the schedule may be coincidental, but a similar outcome to what happened in 2004 is unlikely. Illini head coach Tim Beckman has been busy defending himself against allegations that he mistreated his players. According to the Chicago Tribune, Darrius Millines added his voice to Simon Cvijanovic as former players critical of Beckman’s handling of injuries. For a team that snuck into a bowl game last year at 6-6 and desperately trying to turn a corner, this type of controversy is exactly what the Illini don’t need. How much of a story this will be—or if Beckman is still in charge in Champaign on October 3—is yet to be determined. Either way, this won’t help an Illini squad already overmatched against Nebraska. The second incarnation of the Freedom Trophy will be played in Lincoln, with Nebraska coming off a humiliating defeat at the hands of the Badgers last season—a loss that likely contributed in large part to the firing of Pelini as head coach. Both teams will be breaking in new head coaches, with Paul Chryst taking the helm in Madison. But Chryst has deep ties with Wisconsin, and his arrival is nowhere near the culture shock that Riley is in Lincoln. This game may well be the de facto Big Ten West championship game, and should be fascinating to watch. But given how Wisconsin has played against Nebraska in their last two encounters, it’s hard not to lean towards the Badgers. They couldn’t make it three straight, could they? It’s hard for Nebraska fans to wrap their collective heads around this, but the Golden Gophers hold a two-game winning streak over Nebraska. In 2015, though, Nebraska will not be trying to massage a clearly-injured Taylor Martinez through a game at quarterback like it did the last time the two met in Minneapolis, and Minnesota will not have David Cobb running the ball. Combine that with the talent disparity (Nebraska at no. 24, Minnesota at no. 64 in 2014, according to CFBMatrix), and 2015 should be the year Nebraska breaks the Gopher jinx. In 2012 and 2013, the Purples had Nebraska dead to rights, but couldn’t land the knockout blow. After a win in 2011, Northwestern could easily have been 3-0 against Nebraska going into last year’s game in Evanston. But Nebraska pulled away in that game, winning 38-17. Northwestern slipped quite a bit last season, finishing at 5-7. There’s little to suggest that the Purples will be able to right the ship in 2015. Purdue’s last bowl appearance was after the 2012 season, where the Boilermakers lost to Oklahoma State in the Heart of Texas Bowl, 58-17. Since then, Purdue went 1-11 in 2013 and 3-9 in 2014. So, yes, there’s progress. But there’s also quite a ways to go. And even with the game being at home (and on Halloween, no less), the disparity between Purdue and Nebraska should be on display. Say goodbye to former Legends Division rival Michigan State, as the Spartans fall off Nebraska’s schedule with their relocation to the B1G East division last season. And given how Michigan State has fared against Nebraska recently (winning two straight), Nebraska fans might not be sad to see them fall off the schedule. But Michigan State returns the most experienced and effective quarterback of Nebraska’s 2015 opponents in Connor Cook. And while the Spartans do lose receiver Tony Lippett and running back Jeremy Langford to the NFL, head coach Mark D’Antonio’s defense should still be a stern test for Riley’s pro-style offense in its first year in Lincoln. For a time, Rutgers looked like it might have a sneaky good 2014 football season. The Scarlet Knights started out 5-1, with their only loss a 13-10 heartbreaker against Penn State. Then, the Knights were drubbed by Ohio State, 56-17, and proceeded to lose four of their last six games. Rutgers did finish last season at 8-5, with a win over North Carolina in the Quick Lane Bowl. But Nebraska handled Rutgers comfortably last year, 42-24, and there is little about a trip to Piscataway that suggests a different outcome in 2015. Hawkeye fans were amazed at how Iowa stumbled to the finish line in 2014, losing three of its last four games (including blowing a 17-point lead to Nebraska before losing in overtime), and yet seeing Nebraska and not Iowa make a change at head coach. Iowa has now handed the keys at quarterback to C.J. Beatherd, a move many Hawkeye fans had been clamoring for throughout much of 2014. Neither team has won a home Heroes Game trophy since the inauguration of the anodyne monument in 2011. But given Iowa’s struggles to find traction over the last few years, look for Nebraska to break that streak in 2015. ← Nebraska Football: Who Is Replacing Every Former Husker Taken in the 2015 NFL Draft? Hmm, losing to Miami, Wisconsin, and Michigan State? Sounds like a case of a coach who can’t win the games that matter most! We need to change him immediately! Gaaaaaaah! Still, I’m not ready to concede the loss to Miami just yet, though. Everything the defensive players have said about the new scheme has been very positive, which is to be expected, but they’ve also said (or at least implied) a lot of negative about the old scheme, which is not expected. Granted, a lot of it depends on how well the scheme has “taken root” that early in the season, but if the Blackshirts show up playing better than they did last year, that should be enough to give Brad Kaaya nightmares. A lot of people said they were really impressed with how he played last year. I was at that game, and I don’t get it. He had two interceptions and should have had another if not for a questionable roughing the passer call, and as I recall he lost a fumble (ESPN keeps really shoddy records on QB fumbles, so I’m not sure on that) and could have easily had another. Our defense easily could have recovered a ball he lost, if they hadn’t mistaken it for an incomplete pass. I know our defense gave up some easy yards and easy points that game, but forcing turnovers covers a multitude of sins, and if they can come anywhere close to the 5 they should have forced in Lincoln, that’ll be almost impossible for Miami to overcome. That game could easily go the way you predict it, but I think I like our odds. Otherwise, I think you’re pretty well on-point here, as disappointing as it is to realize we’ll have to wait another year for revenge on Wisconsin, and who knows how long before getting a chance to break MSU’s suddenly frustratingly-long streak. Can you believe that just two years ago they had never beaten us in history? That seems just impossible at this moment. No, I meant to say Nebraska will be 1-1 after the BYU came. Clearly, right? I understand what you’re saying about Miami, and some of this might well be me trying to temper expectations. I can totally see a scenario where Nebraska runs the table in the non-con, and is 5-0 coming up against a Gordon-less Sconnie in Lincoln. I like that image. But there is SO much new in Lincoln that it’s hard to be confident about success like that. So in some ways it’s safer emotionally to expect the worst (or at least the same) and allow yourself to be pleasantly surprised. It’s weird to think about Nebraska’s losing streak to Michigan State? Nebraska has a two-game losing streak to Minnesota! Fer cryin’ out loud, Nebraska beating Minnesota is Tom Dienhart’s “upset pick” for Nebraska’s 2015 season — meaning he thinks Nebraska will “upset” Minnesota in Minneapolis this year. Given the history, I understand why he says that, but good heavens, is that what Nebraska has become? 1999 doesn’t seem like it was that long ago, but ultimately that’s a long, long time.